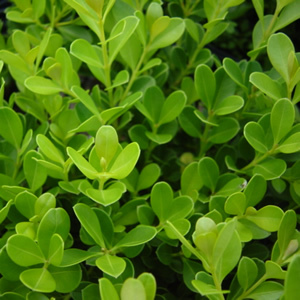 Japanese Boxwood is a dense rounded shrub growing only 6 feet tall, but grows faster than the species. The small, lance shaped leaves are dark green and turn bronze in winter. Great for shaped hedges in the landscape. Buxus microphylla var. japonica tolerates heat, humidity, and nematodes better than most boxwoods. Also this variety has been reported to do will in the rocky soils of Austin, another plus is the deer do not eat it.